. . . and by God’s providence, I am a photographer. I have been practicing landscape photography since the early 1970s, working in both 35mm and medium format, and expanding into large format in 1990. My gelatin-silver prints have been accepted into and won awards at juried exhibits across Kentucky and Southern Indiana, and from Atlanta to Iowa. 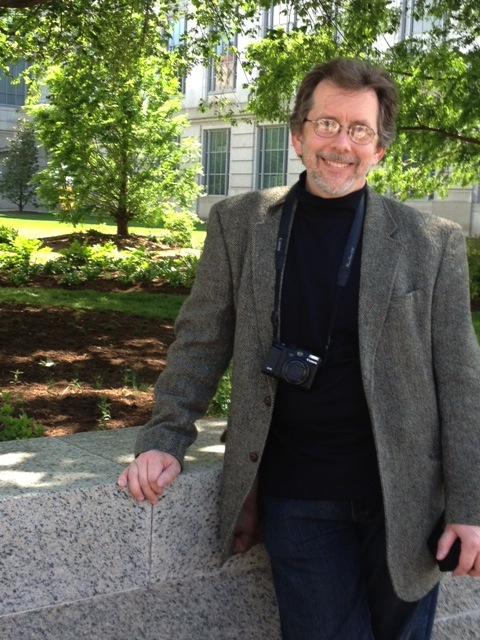 As an avid freelancer, my work has also included architecture and the performing arts. Several of my images were selected for the coffee table book, Louisville, A River Serenade (Tower Publishing, 1996; Dan Dry, Photography Editor), and I created a memorable series of cover photos for Louisville Music News (a monthly publication) from 1995 to 2001. In the mid-2000s, I returned to landscape photography, creating a compelling series of new images using the digital medium. In 2013 I self-published a retrospective coffee-table book, ‘Pursuing the Light – Forty Years of Photography’, which provides a real-world example of my photography and my sense of design, as well as of my ability to create a premium, top-tier publication, bringing a large, complex project to successful completion. You can read my thoughts on photography and my approach to the Thebaid Project in this special article. Orthodoxy: I was received into the Orthodox Church in 1987 at Archangel Michael Church (Louisville KY, Antiochian) by Fr Alexander Atty of beloved memory, and my first exposure to Orthodox monasticism was through parish retreats to Transfiguration Monastery in Ellwood City PA, as well as two trips to Mount Athos in 1988 and 1990 with Fr. Alexander. At St. Michael’s until the mid-1990s I taught church school, sang in the choir, served as bookstore manager, and used my photographic skills. 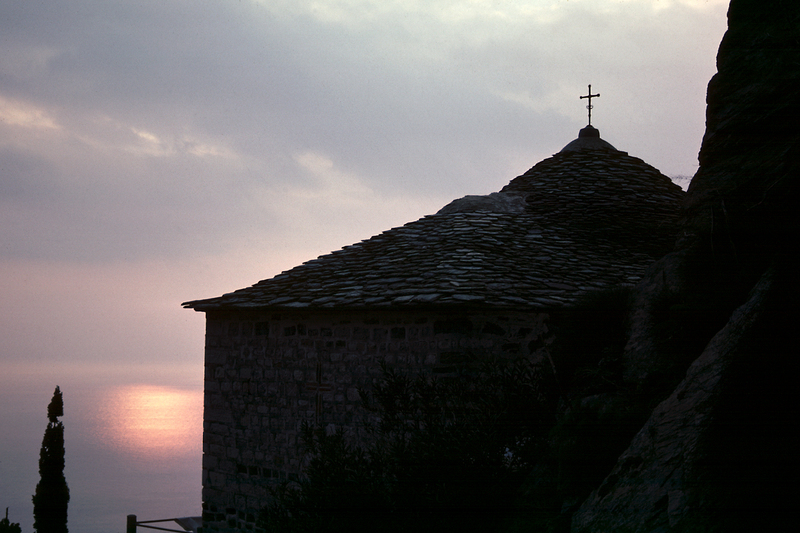 Sunset at St. Anne’s Skete, Mount Athos, 1988. Web-Design: In 2001 I became a member of Christ the Savior-Holy Spirit in Cincinnati (Fr Steven C. Kostoff, rector), and very soon began applying my photo, graphic design and web skills. I have served as parish webservant since 2004, and over a period of several years expanded greatly the site’s presentation of traditional Orthodox teachings, creating feature sections on the Great Feasts, Great Lent & Holy Week and Pascha to Pentecost, and All Saints of North America, with special pages for St Herman of Alaska and St John Maximovitch. One of the special features of the website I feel most strongly about is ‘Monastic Matters’, which provides an introduction to Orthodox Christian Monasticism, a survey of several regional monasteries, urging the reader to visit, and hosts feature articles on Orthodox monasticism. My work on the parish website has yielded measurable results. The website’s monthly traffic averages between 5,000 and 9,000 total visitors, and a unique ratio of 40+%, accessing 50,000-60,000 pages (sometimes twice that during Holy Week-Pascha), with monthly bandwidth use ranging from 3.5-6.5 GB, and twice that since adding more video features. We have an international audience as well, with approximately 17% of our visitors from Europe, Russia, Asia and elsewhere. Fr. Steven Kostoff’s blog Orthodox Christian Meditations (which is linked with the parish website) likewise continues to increase its audience, averaging over 1500 pageviews per month, and nearing 150,000 total views (since we re-launched it on the Google Blogger platform in late 2007; 75% of the total views have been during the past three years). More important than these statistics is the anecdotal evidence from new parish members that the parish website is drawing people to the church to “Come and see.” My optimization of search engine use ensures our parish site is at or near the top of any search for Orthodox churches in Cincinnati. Everywhere on the site one is invited to visit, join us for worship, and to explore and learn about the Orthodox Faith not merely online, but through life in the Church. In summary, I see all my labors for the parish as ultimately having a missionary and/or catechetical purpose, designed to draw and retain enquirers, and provide substantial online resources to help in the building up of the faithful. I see The North American Thebaid Project as a continuation of my desire to serve the Church, laboring with the talent entrusted to me, and ask your prayers and support for this worthwhile endeavor.